When I was a kid, the small town that we lived in had an Italian eatery called John's Pizza. It wasn't a chain or a huge, gimmicky place, but every kid who lived in Ridgecrest, California had a birthday party there at some point in their pre-adolescent lives. The reasons were simple: 1) the pizza was cut into squares instead of triangles, which totally blew our young minds, and 2) they had the most incredible homemade ice cream with candy bar flavors. Snickers was always the most popular (chocolate ice cream with giant pieces of Snickers candy bar swirled in), but Almond Joy (vanilla ice cream with chunks of Almond Joy) was a close second. Instead of pieces of candy, my version lets each ingredient stand on its own, so you get coconut (toasted to bring out the flavor), crunchy almonds, and chocolate in every bite. It's as good, if not better, than John's version, and I didn't even need to pull out my ice cream maker! Place two clean metal loaf pans in the freezer and preheat oven to 350°. Spread coconut on a baking sheet and bake for about 5 minutes, or until it's lightly browned. Remove from oven and set aside to cool. 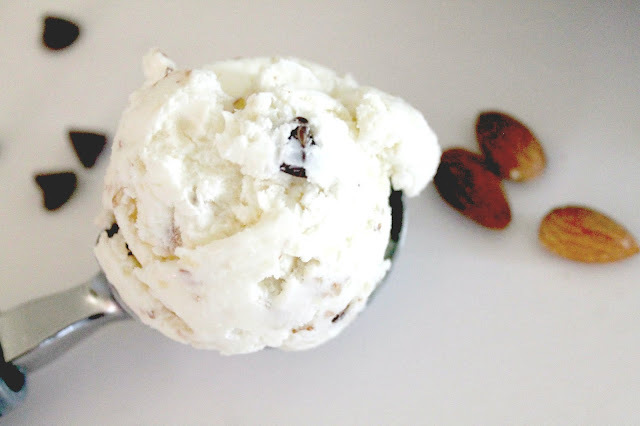 While coconut is toasting, roughly chop almonds so you're left with both big and little pieces. Pour whipping cream into a large bowl and beat with electric mixer until soft peaks form. Add the sweetened condensed milk and blend until combined. 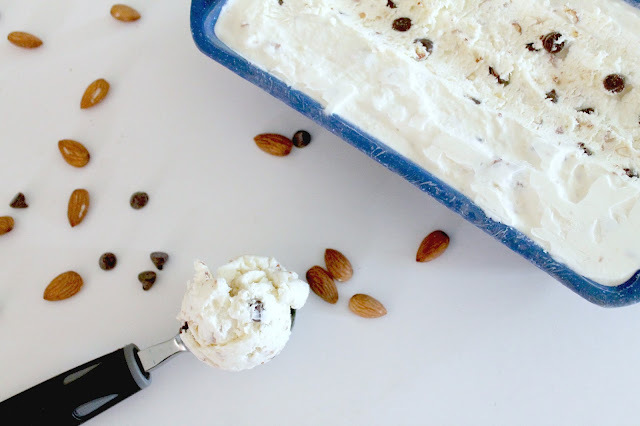 Gently fold in your coconut, almonds, and chocolate chips and lightly stir to distribute the ingredients throughout the ice cream base. Pour the ice cream mixture into the cold loaf pans, cover tightly with plastic wrap, and freeze for at least 6 hours. Scoop and enjoy! Yuuuuuum! Okay this something I totally need to try! It's so good! You'll love it. And no ice cream maker required!